It is that time to start compiling my belongings to pack the car for SAGA convention. Whew. This is what a Wee Care jungle looks like before it is tamed and packed up. Sorry for the fuzzy picture, I was in a hurry. We won't even talk about whether class supplies are together or laundry done. The answer to both of those is NO! Have to run, lots to do before I leave Tuesday. 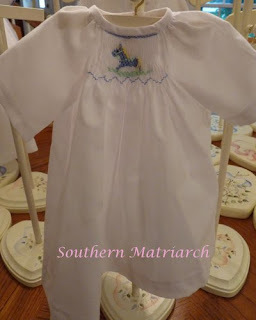 Parting shot, a tiny 1-2# size Wee Care gown with a picture smocked rocking horse. There is a lot not right with this little gown but it is still sweet. 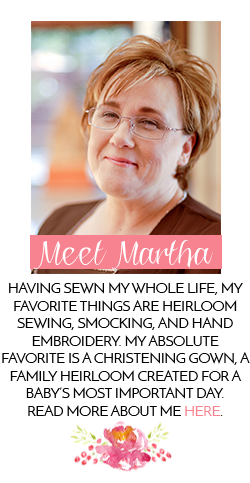 Martha.....be safe and have fun at the convention. I'm sorry I won't be bumping into you at the Market this year....just too far to drive with four little ones!!! Can't wait to hear about your adventures!!! Hi there, I too smock and have made the wee care pattern many times. Have a great time at the convention - I dream of getting there one of these years. 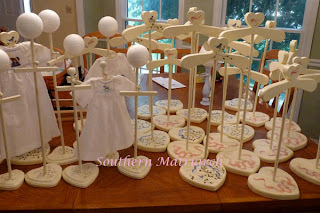 Question - where did you purchase the adorable hanger/stands? What beautiful stands for your gorgeous Wee Care projects! You are a blessing! Thanks Cindy, would have loved to see you, but I think you have your hands busy these days. :) It was wonderful. Saw Penny, Abbie and Claudia there. You would have been a great addition. Lynette thank you very much. I hope you will try to make it to convention soon as well. I will try to email you about the stands. Karen, thanks so much. I stopped by your blog(s). What pretty work you do.